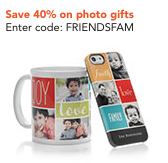 Don’t miss two new Shutterfly coupons to help you save on holiday photo projects or cards. These codes can be used together, so make a few gifts and really save! Here are a few prices to help you decide what to make… everything is after the 40% off coupon code. If you bought the Mug, Calendar and Key Ring, they would be enough to qualify for free shipping! The coupons are good through 11/25.